The year was 1966 and John Robert Brayford didn’t even exist when one of his heroes, John Lennon, proclaimed that The Beatles were more popular than Jesus. “Christianity will go. It will vanish and shrink,” Lennon told a reporter from London’s Evening Standard newspaper. “I needn’t argue about that; I’m right and I’ll be proved right. We’re more popular than Jesus now; I don’t know which will go first - rock ‘n’ roll or Christianity. Brayford, a refreshingly placid and sanguine 27-year-old from Stoke-on-Trent, has Lennon’s face inked on his upper right arm and if you had posed the question on the streets of Bramall Lane at the weekend - John W. Lennon, Jesus H. Christ or John R. Brayford - it wouldn’t have been too difficult to Imagine the outcome. (Sorry). For Brayford is arguably bigger than Jesus, the Beatles and probably most other things around Sheffield 2 at the moment. Which, for such a humble and down-to-earth character as Brayford, must seem ever so slightly bizarre. For the unacquainted, or for those who have spent the last week or so under a rock somewhere, Brayford signed a permanent deal with United at the weekend. 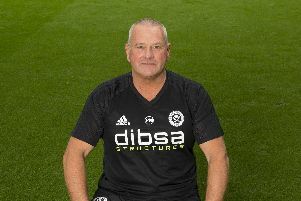 He first arrived at Bramall Lane just over a year ago, on loan from Cardiff City, having worked with United boss Nigel Clough at Burton Albion and then Derby. Brayford credits Clough with kick-starting his career, and says he signed on loan for League One United to repay a “debt of gratitude” to his old boss. But he didn’t count on falling in love with life at Bramall Lane, as his efforts during a 20-game loan spell transformed United’s fortunes on the pitch and made him into cult hero off it. The hipster beard and hair - “I don’t know why I grew it,” he confessed once - to Robbie Savage, of all people. “I saw a cool guy with one and fancied it” - helped. As did his whole-hearted attitude to help United’s cause in any way. Clough tells the story of Brayford at Fulham, in an FA Cup replay not long after he had arrived at United. The game went into extra-time and Brayford was, for want of a better word, knackered. Clough advised him to conserve his energy and protect United’s goal. The full-back agreed. And moments later he was bombing down the wing with the ball at his feet, tongue out, hair flapping. Always going forward. He just couldn’t help himself. Perhaps Brayford’s biggest asset, though, is the most simple, the most innate. For unlike most who are lucky enough to kick a ball around for a living, there is no separating John Brayford the player, from John Brayford the person. He is a throwback to an increasingly-bygone era where playing football was seen as a priviledge, not a pension. He took a substantial pay-cut to rejoin United and dropped a league, simply because it was where he wants to be. He felt loved at Bramall Lane and he loved Bramall Lane, too. Don’t forgtet, he featured at Cardiff - playing 28 games this season in the Championship - but once the call came from United, it was a no-brainer. The man himself says there was a “0.1 per cent” chance that personal terms would not be agreed. And that is probably being generous. “People talk about footballers signing at clubs for the money, but there is more to being a footballer than making a few extra quid,” he said. “For me, it’s about being able to look back on my career and be able to watch, read and remember all the good times, all the moments that can never be replicated once you have retired. There does exist, somewhere, amongst the outpouring of elation greeting his arrival, an element of United’s support somewhat underwhelmed by the signing of Brayford, especially for a rumoured fee of £1.5m at a time when a proven striker could make all the difference in a play-off push. But try telling that to those who donned Brayford masks to Wembley last season and set up a ‘Braywatch’ Twitter account detailing his every move in South Wales. We have previous for cult hero right backs in this region, of course. Wednesday’s Lee Bullen was no Cafu, yet earned himself a place in Owls folklore - even playing in goal along the way. Which perhaps sums up his character far more accurately than any of us ever could. Without question, he is an intelligent man with an appreciation of life. But John Brayford is more than a footballer, and no more than a footballer at the same time. “Something told me when I left at the end of last season that I would be back,” he said. Maybe so. Brayford is far from thick and, as the reaction to his homecoming has proved, he is certainly far from ordinary. Not to Blades fans, at least. John Lennon would be proud.